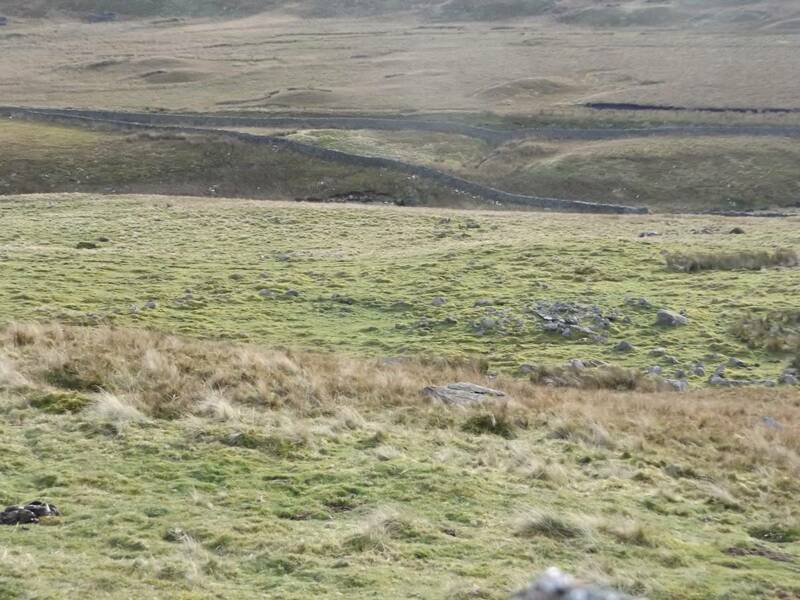 Location Stainmore Summit. South of Rey Cross and the A66 Road . Geology This settlement is located on the line of the Stainmore Fault with both limestone and sandstone strata exposed. 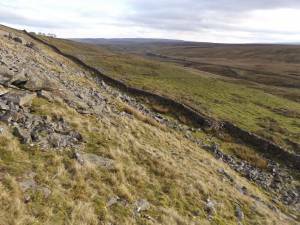 Rock strewn terrace below sandstone fault scarp. 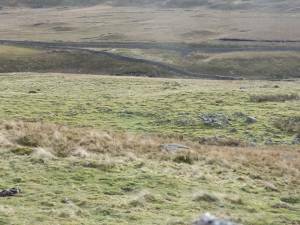 This terrace overlooks the glaciated valley of The River Greta and commands fine views eastward through the Stainmore Pass. Record Description The settlement remains recorded here are located immediately south of Rey Cross and directly below the A66 Road. 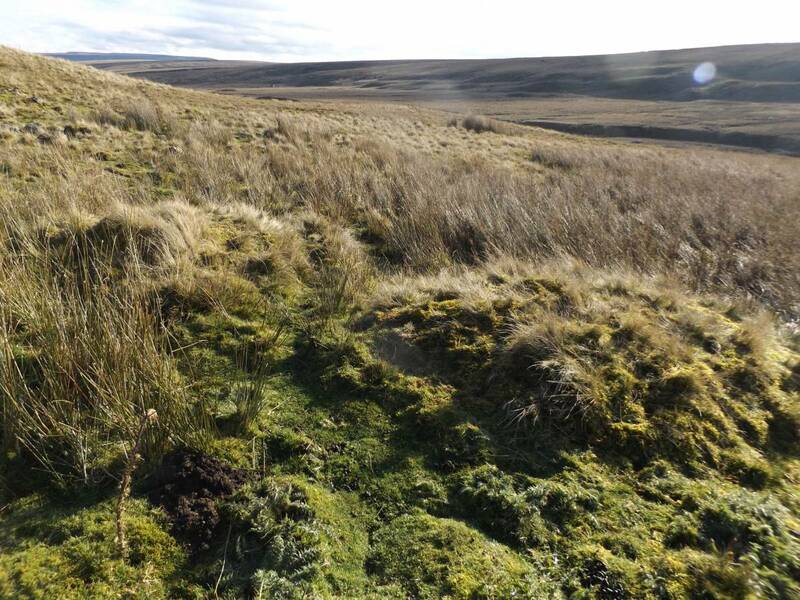 The evidence for Bronze Age and Later Prehistoric Settlement activities survive for a distance of some 500m eastward from a recently recognised burnt mound located at a spring rise at NY900121,425m AOD. 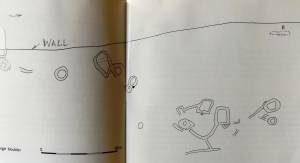 The visible archaeological remains include the following features recognised during one brief walkover: Bronze Age Remains Structures characteristic of Bronze Age Activity include: 1. A medium size burnt mound some 7m*4m overall located at a spring rize. See image No 10 below. 2. 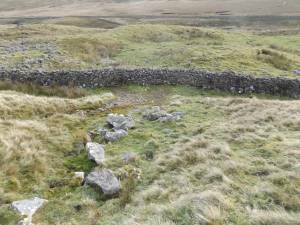 A slight stone banked ringwork with attached cairn. See Photo Image No 7 below 3. A probable ring cairn (or small hut circle), see image nos 5 and 6 below. 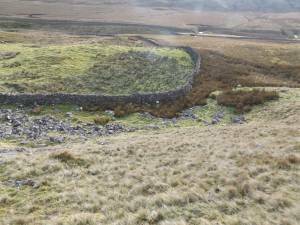 This ring work is defined by a circular stone dump bank with larger retaining stones on both sides but with no visible entrance. The absence of an entrance and relatively small diameter of this ring bank suggests that this feature is not a hut circle. Later prehistoric settlement remains: 4. Extensive simple and roughly constructed sub rectangular or sub circular stone walled enclosures and small circular structures typical of transient high level sheiling type hutments and stock pens of all and any period. The features have been surveyed within the walled pasture. 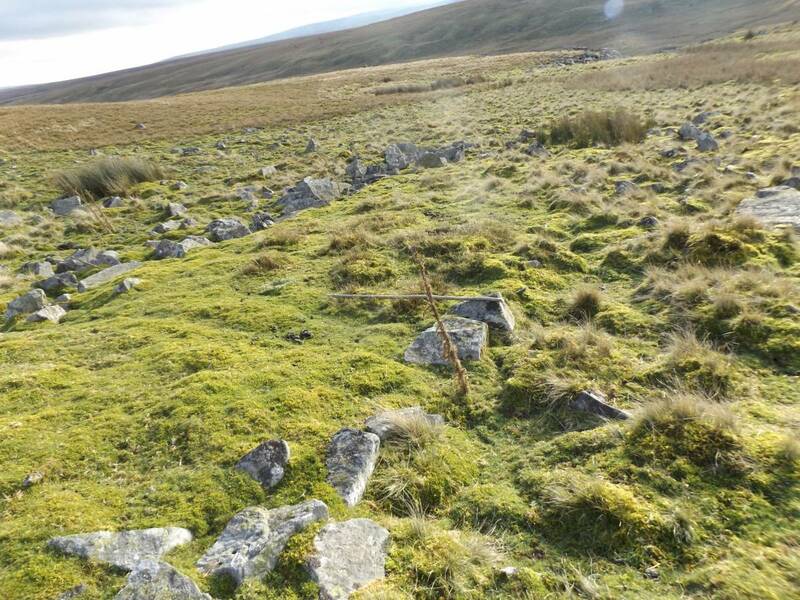 Further stone structures which may be small hut circles are located at the base of the steep rocky slope outside the modern field wall. 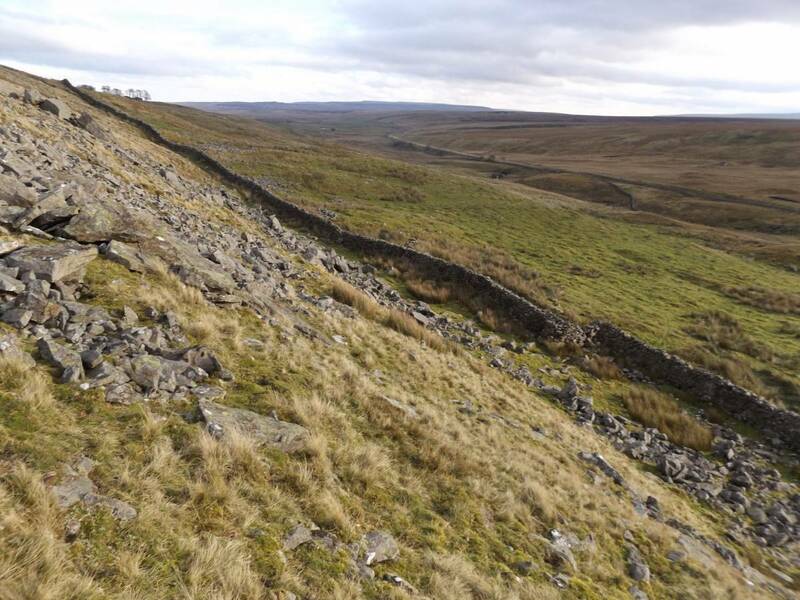 The settlement is described within the A66 Project as Romano British in date. The FinalA66 Project Survey is less specific and describes these features as of different periods. 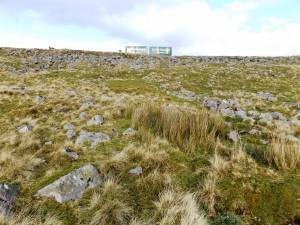 See extracts from the A66 Survey PLan, Image Nos 2 and 3 below. 5. 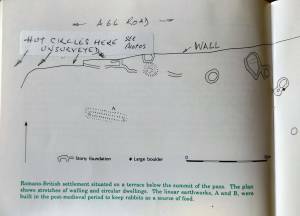 Hut circles and enclosures north of the modern enclosed pasture wall and additional to those surveyed by the A66 project have been recognised. See note on A66 Survey extract below. Additional Notes This record is intended to be a brief introduction to this multi period settlement complex which is of considerable interest.It is well located to take advantage of the good grazing available on the limestone outcrops of the Great Limestone and Four Fatthom limestone. The settlement is at a remote but strategic location immediately below the Roman Road and Marching Camp at Rey Cross. The Late Viking Rey Cross itself and east of the isolated rectangular structure interpreted as a Viking Age Long House first recorded by the Late Dennis Coggins (Coggins, D. 1992. 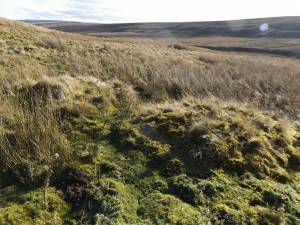 'Shielings and farmsteads: Early Rectangular Buildings in Upper Teesdale.' 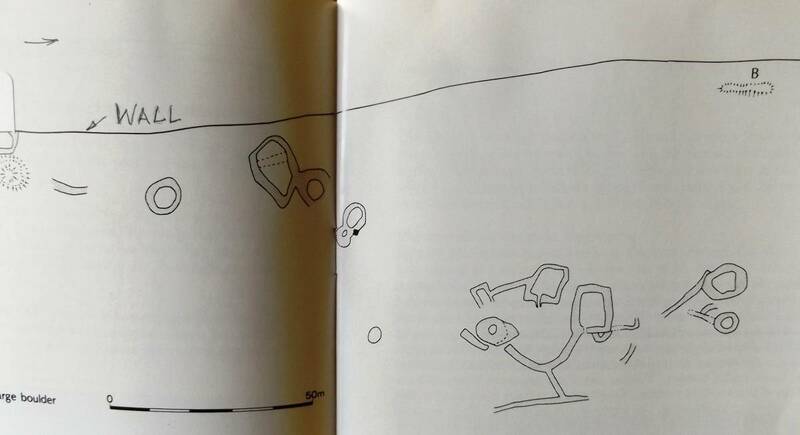 Durham Archaeological Journal 8,1992.77-83. Figure 2(d)). This isolated rectangular structure has been revisited and will be described separately within a future Record on this Database. Image 1 Description Stainmore Summit, below Rey Cross. Undated settlement remains survive both outside the field wall shown on this photograph, and within this improved Pasture. Image 2 Description Extract from the A66 Project 1989/91 Booklet Survey plan with additions. The western part of the settlement within the walled field and the location of further hut circles (see photos below) cut by and outside the modern dry stone field wall. 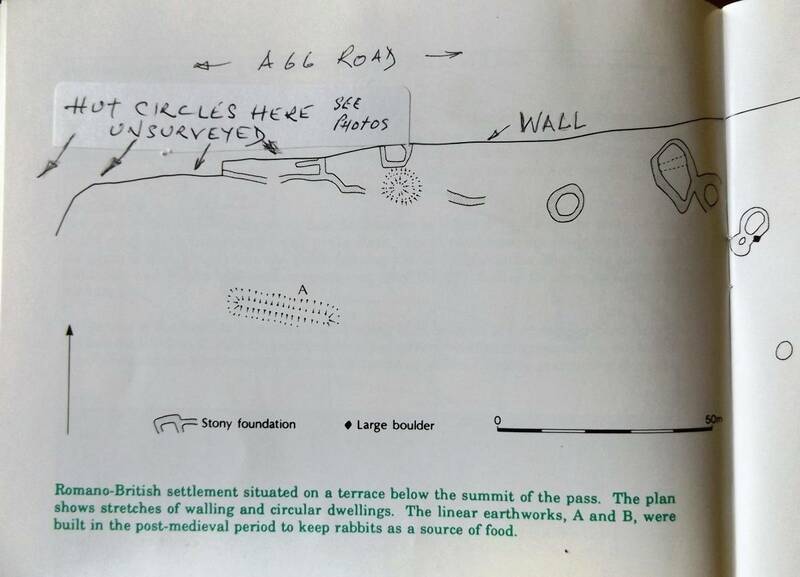 Image 3 Description Extract from the A66 Project 1989/91 Booklet Survey plan with additions. 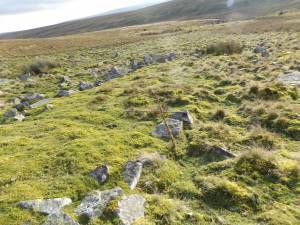 The western part of the settlement within the walled field and the location of further hut circles (see photos below) cut by and outside the modern dry stone field wall. 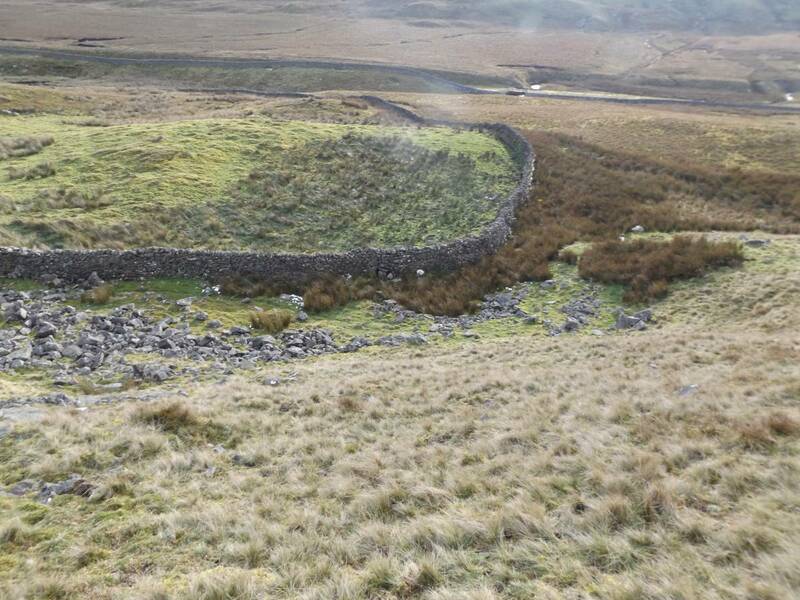 Image 4 Description View down from the fault scarp to show the western part of this settlement and the additional hut circles outside the field wall not shown on the A66 Project Plan. Image 5 Description Spring rise. 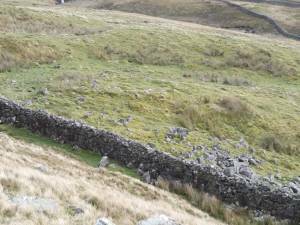 field wall and circular ring bank some ten metres south of the stone wall and within the improved pasture. This ring bank has no entrance and is interpreted as a possible ring cairn. Image 7 Description Spring rise. 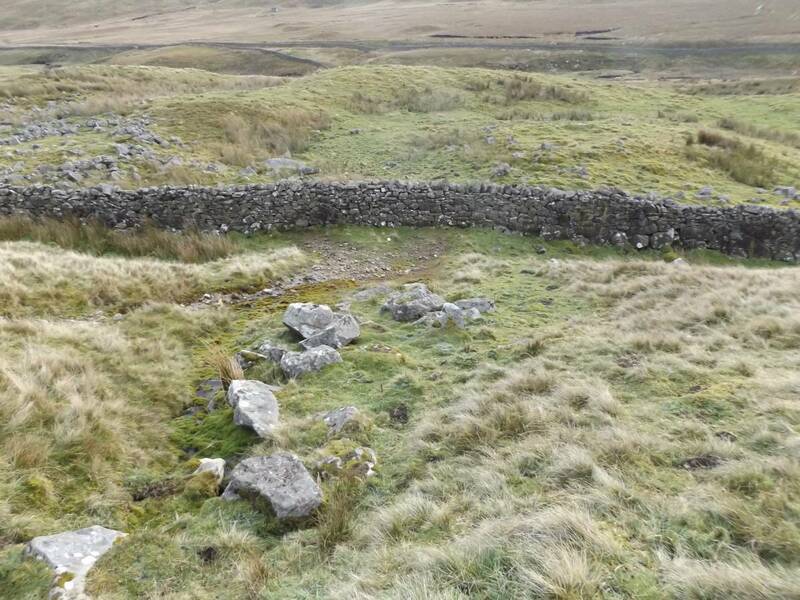 field wall and slight curvilinear stone banked enclosure with attached collapsed cairn or possible beehive hut structure. Image 8 Description Rectangular structure some 20m *5m overall interpreted as a Norse Long House. This structure backs onto the scarp slope below the A66 Road as the Articulated vehicle indicates. Hoard of Viking silver bars now in the Bowes Museum found nearby. Image 9 Description View of the same structure from the slope above.